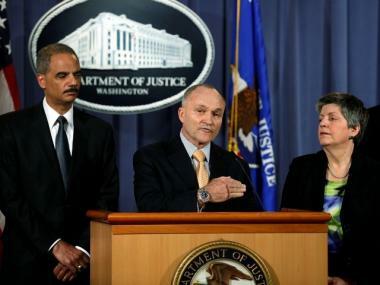 Police Commissioner Raymond Kelly speaks at a press conference held by U.S. Attorney General Eric Holder (L) at Department of Justice headquarters regarding the investigation into the recent attempted Times Square car bombing May 4, 2010. Also pictured is Secretary of the Department of Homeland Security Janet Napolitano. "One day at a time," Police Commissioner Ray Kelly said. "I am taking it one day at a time." I seldom like to speculate publicly. But this remark made to me speaks volumes about how long Kelly may remain the New York City Police Commissioner. He even indicated as much when I bumped into him at the Inner Circle political dinner a few weekends ago. Kelly is always a tough guy to read. And when it comes to discussing any new job possibilities beyond the NYPD, Kelly and his handlers always insist he has the only job he cares about. It’s the job he loves. There is no place he would rather be. He wants to be the longest serving top cop in New York history. He loves New York. So does his wife. There is never even a hint that he would consider another position, including when he was mulling a run for mayor before Michael Bloomberg overturned term limits and spent $100 million to be re-elected. But at the Inner Circle, I asked Kelly about the FBI prospects and his future. Rather than giving me the standard brush off, the commissioner raised his right index finger in the air and said, "One day at a time, Murray. I am taking it one day at a time." He then turned and continued into the ballroom. Now his simple aside to me might not sound like a giveaway quote and was just a casual quip that I am over analyzing. But Kelly generally plays his cards so close to his chest that the remark seemed to this mind-reader to be a "tell," which in poker parlance is a "subtle but detectable change in a player’s behavior providing a clue to the players hand," according to Wikipedia. Not surprisingly, Sen. Chuck Schumer has recently started talking up Kelly, but this offer for Kelly has been on the table well before the senator weighed in. It was made in stone last month when Attorney General Holder came to New York to visit NYPD headquarters for a ceremonial event. For his part, Mayor Bloomberg has been saying everything he can to keep Kelly for the next 1,000 days of his third term. That Kelly is the greatest police commissioner, continuing to keep crime at 1960 levels with a shrinking police force. "I, for one, would certainly like -- I expect -- hm to stay," Bloomberg said. But this dance between Kelly and the White House began last summer, with Kelly subsequently raising his profile on counter-terrorism and intelligence matters on television and in Washington. He then visited the White House where he met with President Obama. The FBI job was discussed. After the failed terror bombing in Times Square, Kelly flew to Washington to stand with Holder during the attorney general’s national press conference on the nearly calamitous attack in Manhattan. These types of transitions take a long time. But with current FBI Director Robert Mueller’s time running out, the decision is near. And "one day at a time" brings Kelly one day closer to making an announcement that he is leaving the NYPD. Coincidentally, he is not the only person in this story leaving their job. The attorney general has told confidantes that he will not be around to work the second Obama term, my sources say. That announcement will likely be coming soon now that the contentious decision has been made to try Khalid Sheikh Mohammed and other 9/11 plotters in a military court rather than here in Manhattan.